London is getting some new maggots! 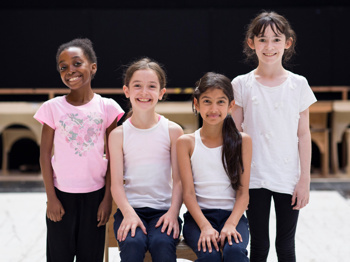 Sara Sheen and Abbie Vena will join Zaris-Angel Hator and Clara Read in the title role of Matilda The Musical from September 13. The Olivier-winning production is playing at the West End’s Cambridge Theatre. The young performers who will be joining the London company in the three teams playing the roles of Bruce, Lavender, Amanda and the rest of the pupils at Crunchem Hall are as follows: Nicholas Antoniou-Tibbitts, Molly Beech, Hannah Bouhamdi, Max Brophy, Olivia Calladine-Smith, Elena Cervesi, Lydia Coghlan, Anya Evans, Miles Harcombe, Michael Hawkins, Sam Jennings, Harrison Langham, Ben Lewis, Craig Noakes, Tia Palamathanan, Owen Pennington, Charlotte Ross-Gower, Alexander Stuckey, Felix Warren and Scarlett Wennink. Craige Els continues in the role of Miss Trunchbull, having first stepped into the girdle in September 2014. Also remaining in the company are Michael Begley as Mr. Wormwood, Miria Parvin as Miss Honey and Rebecca Thornhill as Mrs. Wormwood. Directed by Tony and Olivier Award winner Matthew Warchus, Matilda is the story of an extraordinary girl who dreams of a better life. Armed with a vivid imagination and a sharp mind, Matilda dares to take a stand and change her destiny. Based on the beloved Roald Dahl novel of the same name, the musical features a book by Dennis Kelly and music and lyrics by Tim Minchin. The Broadway incarnation of the tuner is set to shutter on January 1, 2017 at the Shubert Theatre.